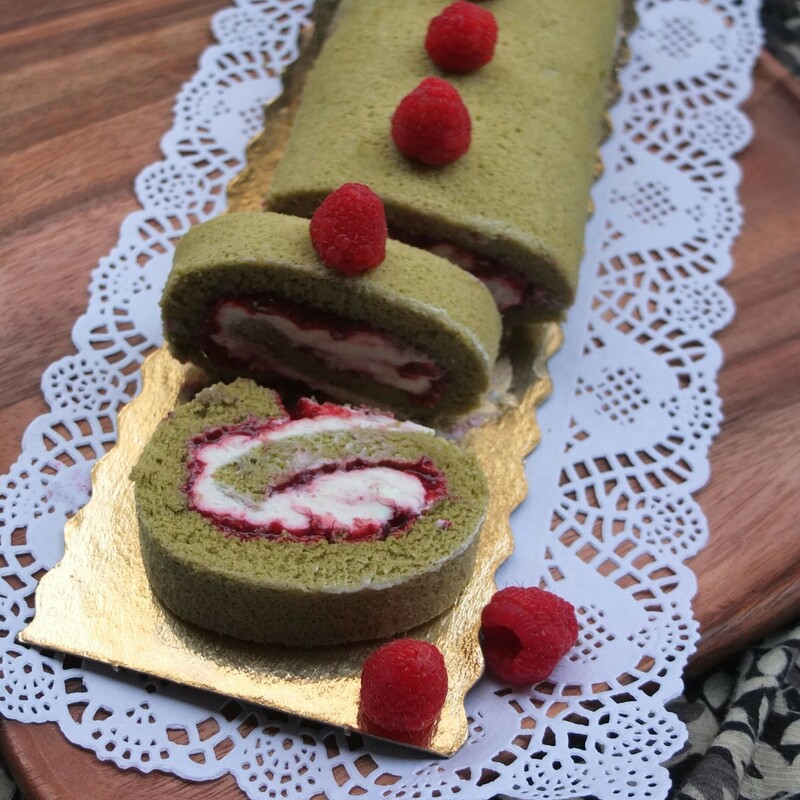 The soufflé sponge always has a lovely texture but my first prototype was pale beige because I used everyday green tea – you need matcha to get the green colour! I also found the sponge needs to cool completely in its plastic bag, at least 2 hours. After 1 hour it seemed cool but probably wasn’t so started cracking when rolled. It’s also important not to overbake the sponge, which makes it dry and prone to cracks. You can see three earlier prototypes in the photo below. 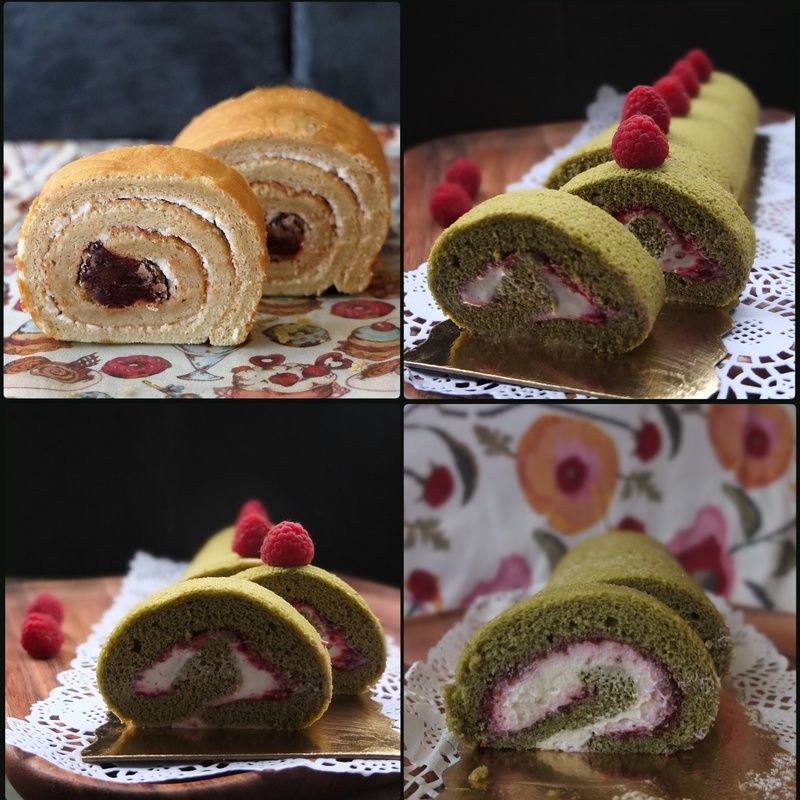 The red bean and cream one is made with green tea (thus its beigeness). It had a subtle flavour and more of a roll because of the wider baking tray (2cm/3/4in high and 38cm x 28cm/15in x 11in). Also the red bean was spread in a line at one end of the sponge and there was just cream (100ml). The other prototype was darker with more matcha (6g) and a rather soft cashew cream mixture. The prototype with the flowery background had a nice roll but too much heavy cream cheese frosting with a dominating flavour. 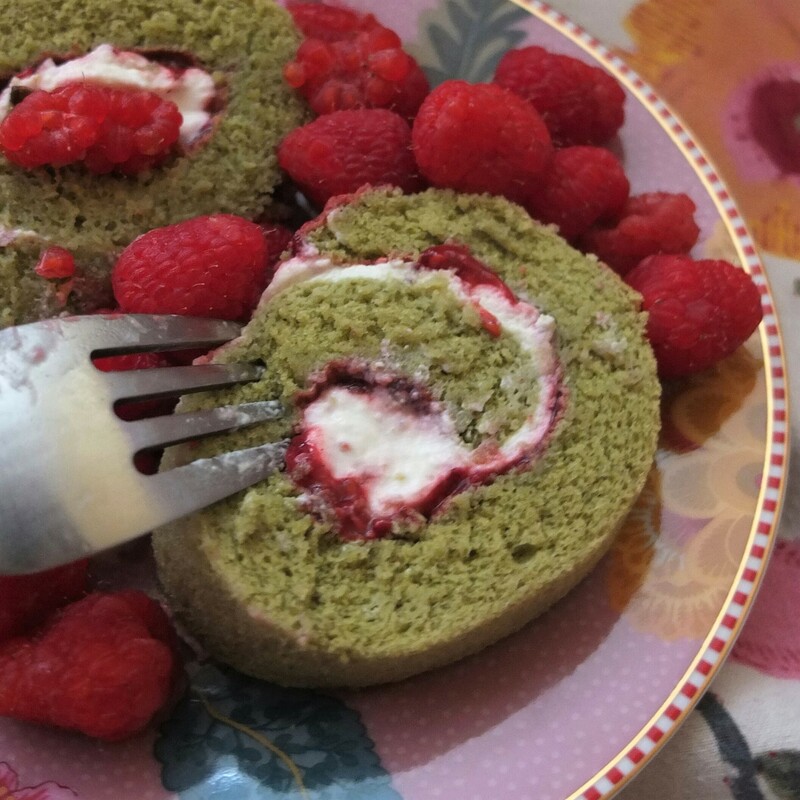 The soufflé sponge is based on a recipe in Keiko Ishida’s Okashi book and adapted to be sugarfree and glutenfree. For the filling some whipped cream is replaced by lighter ricotta and sweetened with unrefined healthier sugar: pure maple syrup. 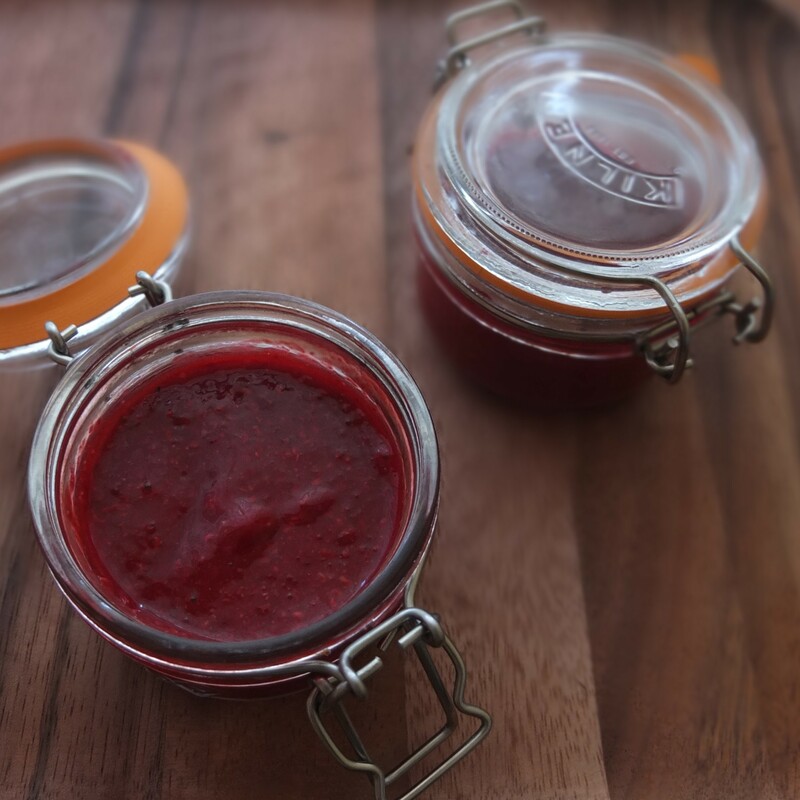 The chia jam is super healthy and inspired by recipes found online and in many superfood books. 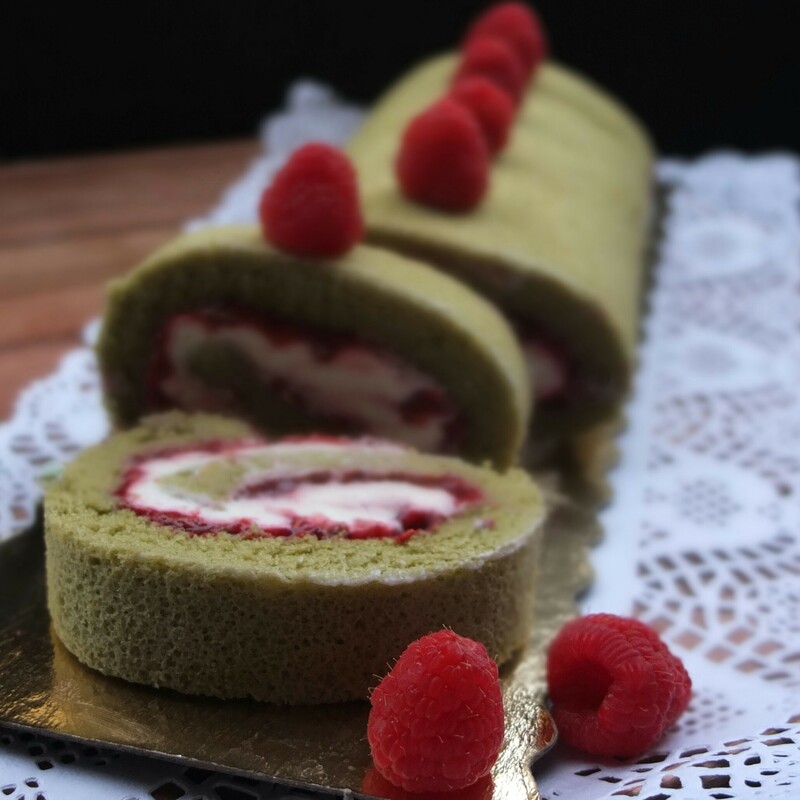 Previous day or early morning: make chia jam and prepare ricotta (5-8 mins); 3 hours before assembly: make soufflé matcha sponge (20-25 mins work; 11-13 mins baking; 2 hours cooling); make ricotta cream (5-10 mins); assemble (5 mins, 30-40 mins chilling). So around 35-50 mins total work and start making at least 4-5 hours before serving. Early morning or the previous night place the ricotta in a sieve over a bowl to drain any liquid. Around 4 hours before assembly press it with a metal spoon through the sieve into a clean bowl (scrape the sieve’s underside really well to obtain scant 1/4 cup or 75g). This gives you creamier ricotta, as favoured by Italians in their desserts. At first it’s strangely like making choux pastry or white sauce! But you get an amazing sponge. Have little bowls with each ingredient weighed out, ready to add quickly. Be careful when separating your eggs: whites must be completely yolk-free and in an extremely clean bowl or they won’t whisk up well. Line a baking tray (about 2.5cm/1in high and 28cm x 23cm/11in x 9in wide, or wider for rolling a thinner layer) with greaseproof baking paper. Find a big plastic bag that easily contains the baking tray (on top of your wire rack) and some clothes pegs or tape to seal it. 40g/1/4 cup + 1 tbsp + 3/4 tsp glutenfree self-raising flour (I used Doves Farm) – if using plain gf try adding 1/4 to 1/2 tsp xantham gum and 1/2 tsp baking powder. 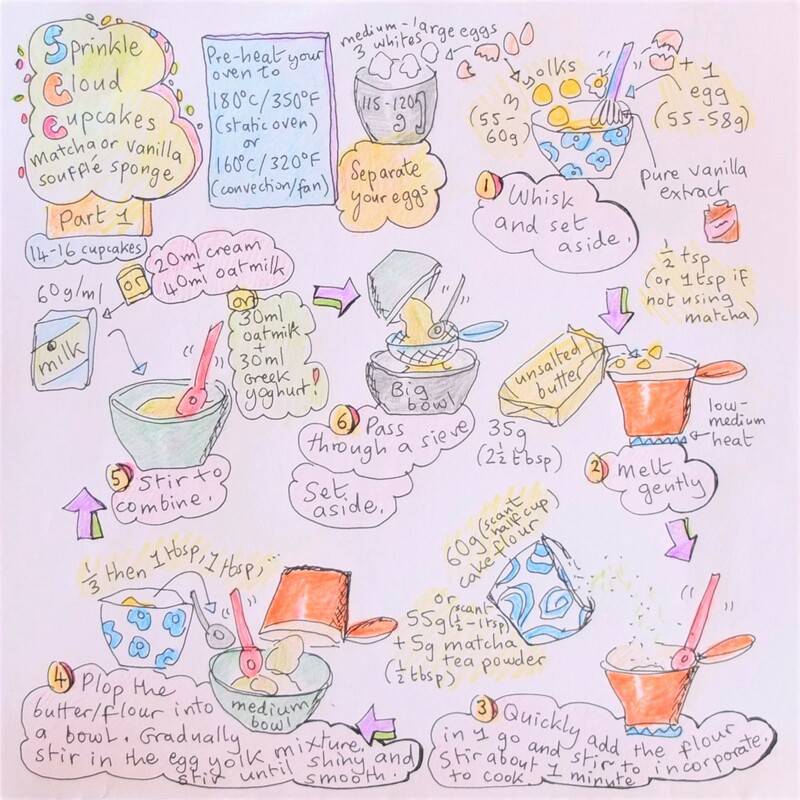 Or use standard cake flour or all-purpose plain flour. 55g/1/4 cup + 2 tsp ground xylitol. Or use caster/superfine sugar. 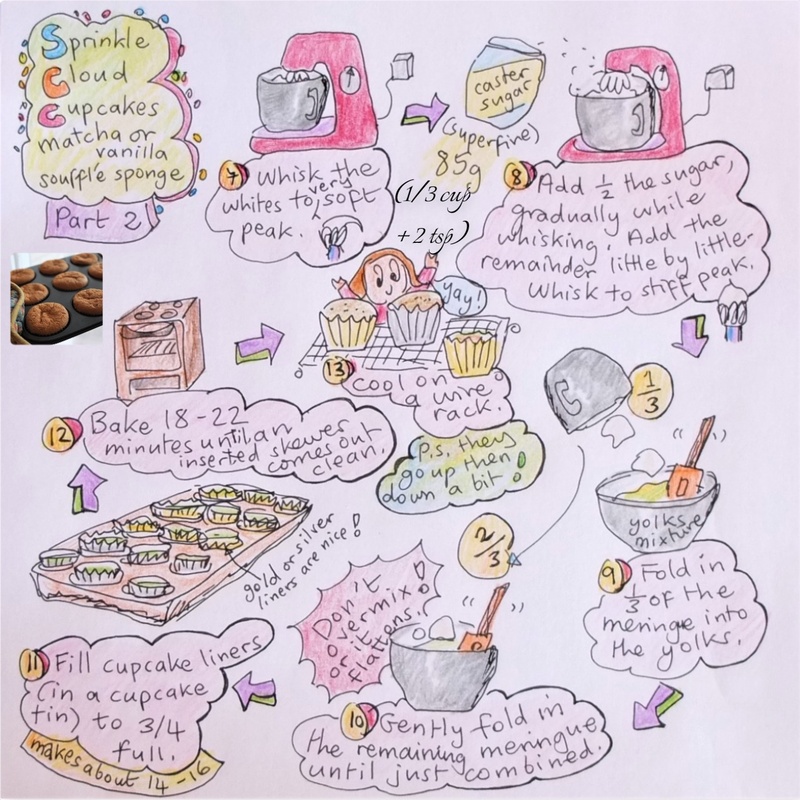 Follow the illustrated recipe for the cupcake version (go around in a snail from top left to centre) but use the quantities above and a baking tray. Spread the mixture gently in the baking tray with a large offset spatula, going diagonally from the centre to each corner then along the sides. 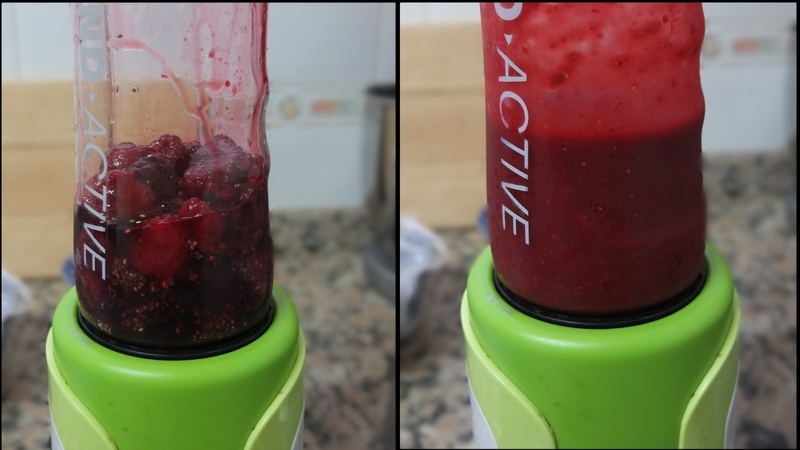 Use the minimum amount of movements necessary or you’ll overflatten the mixture. Bake 11 to 13 minutes (don’t open the oven door the first 10 minutes). The sponge is ready when it’s just starting to brown a little and an inserted skewer comes out clean. When out of the oven immediately slip the sponge off the baking tray (so it doesn’t continue baking and drying) and place on a wire rack. Carefully put the sponge and rack in the plastic bag and seal. 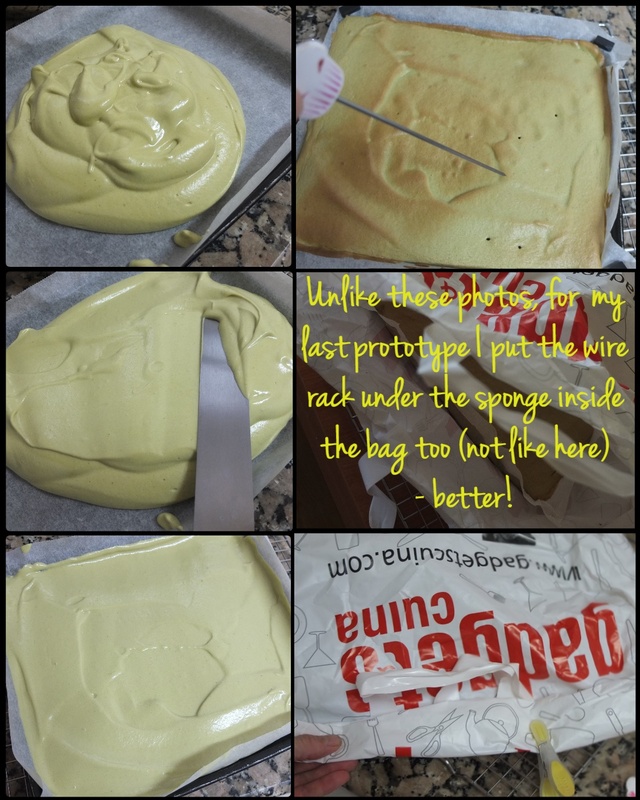 The bag should be loose and not touch or stick to the top of the sponge. Wait 2 hours so it cools completely. Whisk the ricotta, maple syrup and vanilla together in a small bowl until combined. Whisk the cream to stiff peak in a medium-sized bowl. Fold the ricotta mixture gently into the cream with a rubber spatula until combined but still light and fluffy (don’t overfold). Carefully take the sponge out of the bag, turn upside-down and peel off the baking paper from the underside. This should be smooth and will be the outside of your cake. 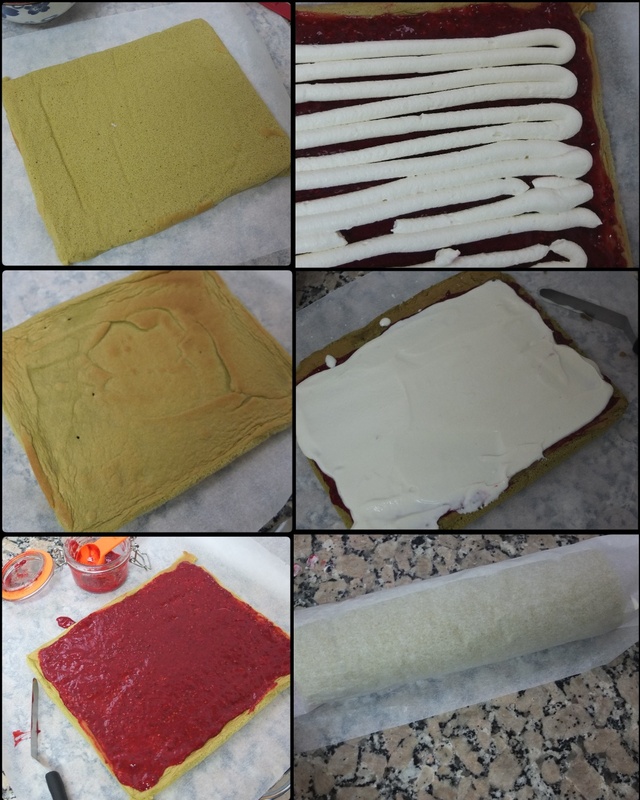 Place a clean sheet of baking paper on top and flip the cake around again so you have the rough top side facing up and the sponge is lying on the clean sheet of paper. Spoon small amounts of the jam all over the surface (except the ends) and delicately smooth with a small offset spatula or back of a metal tablespoon. Place the ricotta cream in a piping bag (or plastic freezer bag), cut a small hole and pipe thin lines over the jam. Delicately smooth with your cleaned offset spatula or tablespoon. Try not to combine the jam and cream but it’s okay if it swirls in a little. Hold the baking paper and use it to help you roll the cake away from you, not pushing too hard or lots of cream will squeeze out. You should finish with the joint seam underneath (and a little cream). Gently press with your hands to help shape the roll cake and pull on the paper a little so it wraps close around the cake and helps keep its shape. This can be a delicate operation so stay gentle. Place carefully on a baking tray and place in the freezer 30-40 minutes so the roll stiffens and is easier to cut. Store in the fridge and eat within 3 days (it’s at its best the first 2 days). To store in the freezer you can first freeze individual slices laid out on a baking tray then wrap the hardened slices tightly with plastic film. Eat within 2 weeks or up to 2 months. 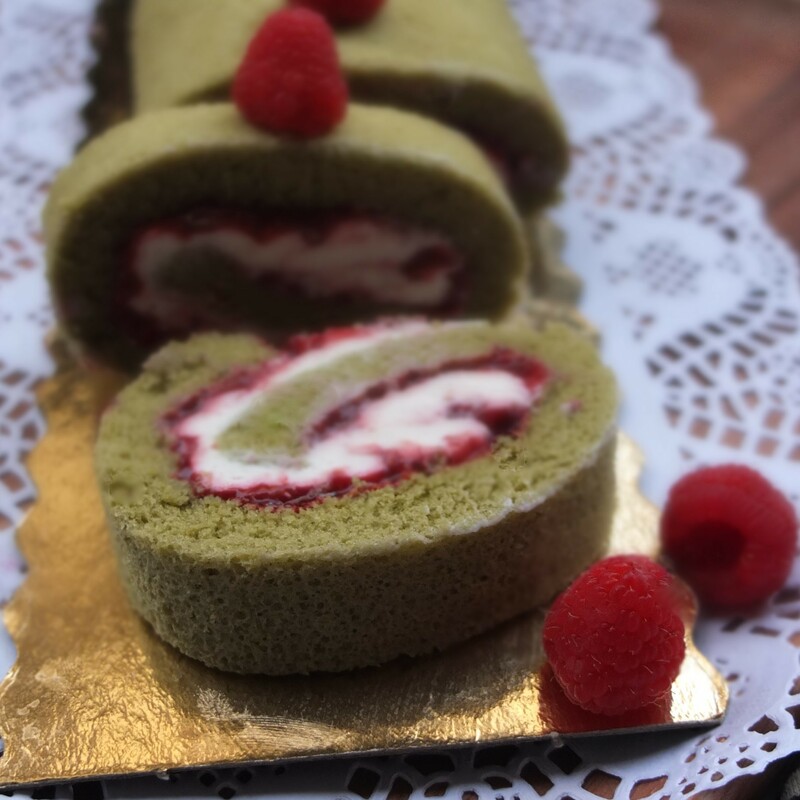 looks yummy and such a beautifully done Swiss roll cake! 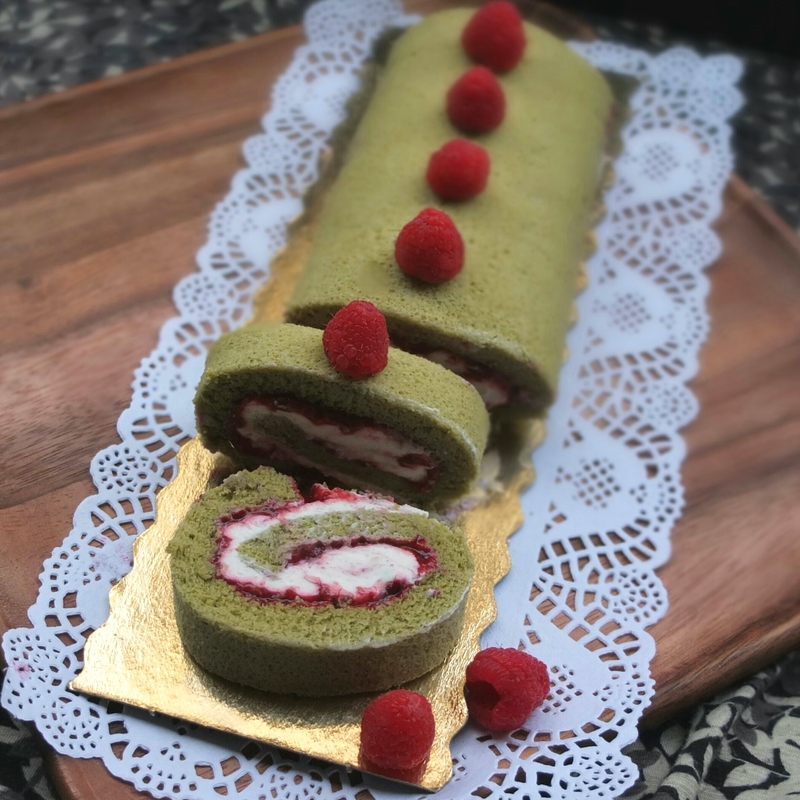 Looks great… and matcha is so popular right now. I’m a bit embarrassed to say I’ve never really tried anything matcha flavored. Maybe I’ll give this a shot!